CARLO LITTLE was the sound of the 60′s.Loud exciting and always in step with what was going on. He was the drummer the ROLLING STONES wanted but couldn’t afford! He provided the beat behind CYRIL DAVIES ALL STARS and was the driving force in SCREAMING LORD SUTCH’S SAVAGES and he taught the young KEITH MOON how to play! This album never released before was recorded in 2000 shortly before Carlo fell ill and sadly died in 2005 with the tapes languishing in limbo. But now it can be heard with it’s ‘All Star’ cast. 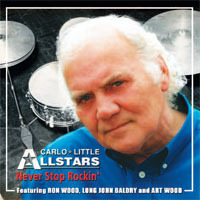 On this album Carlo and other musicians make sure his name remains up there with the legends of the 60′s. Keep on rockin’ indeed. 'It's All Over Now' pays homage to his mates in the Rolling Stones, and 'Iko Iko' shows Baldry's voice at it's best. 'Midnight Special', a traditional folk song features a rare pairing of Ronnie Wood and his brother Art. All in all, this is a perfect tribute to one of the sixties' true legends. It's an electrifying disc, and a fitting tribute to one of the era's most infuriatingly unsung heroes.